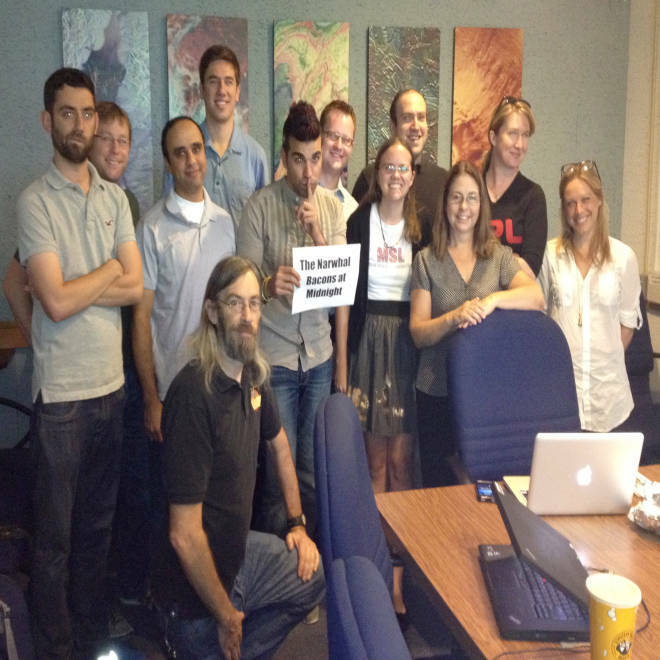 Members of the Curiosity rover's mission control team look into the camera for a group portrait at NASA's Jet Propulsion Laboratory in advance of a Reddit "Ask Me Anything" chat session. After facing the "seven minutes of terror" and landing a car-sized rover on Mars, some of the stars of the NASA's Curiosity mission team faced thousands of questioners on Reddit today — and they definitely delivered the geeky goods. Redditors learned which songs were played to "wake up" the Curiosity rover, what operating system it's running, how mission controllers keep up with Mars time, whether they use Macs or PCs, and even which beers they like to swig. The Q&A session was part of Reddit's popular "Ask Me Anything" series, and today's AMA was exceedingly popular, attracting almost 6,000 questions and comments. Based on the comments, it sounds as if the team is in good humor, more than a week after the white-knuckle landing sequence on the night of Aug. 5. But their diet? Not so great. "This week a few of us have survived on leftover peanuts and Mars bars from landing night — they don't look so good anymore," the team wrote in one of their group postings. A dozen scientists and engineers from mission control at NASA's Jet Propulsion Laboratory sat in on the session, including Bobak Ferdowsi ("Mohawk Guy"), Steve Collins ("Hippie NASA Guy"), Jonny Grinblat ("Pre-Celebration Guy") and Steve Sell (a frequent participant in the Curiosity news briefings), plus Veronica McGregor from the Mars Curiosity Twitter "hivemind." What happens if life is detected on on Mars? "Every science hypothesis is vetted among the team, and we would want to make sure we were absolutely certain it was life/fossils/etc. before releasing it to the public," Keri Bean wrote. "But we absolutely would release this information, once we had sufficient evidence and it was agreed upon among the science teams! We follow this procedure for all of our interesting finds." Did you have nightmares about Curiosity falling? "There was plenty of anxiety leading up to landing and a lot of sleepless nights," Sell wrote. "Despite many team members moving to Mars time schedules, we're all sleeping a lot easier now." Have you adjusted to the 40-minute difference between a Martian day and an Earth day? "Yes, for those of us working the surface mission. It is sometimes difficult but some of us have different ways of coping. One of the team members actually got his whole family (wife and kids) to switch to Mars time until school starts." Here's a Tumblr website featuring the Mars-time family. When surface operations began for the Spirit and Opportunity rovers in 2004, JPL personnel used custom-made watches to keep track of Mars time, but for Curiosity, most have turned to computer apps such as Mars24, or smartphone apps such as MarsClock and Martian Time (for Android), or Mars Clock and Mars Surface Times (for Apple iOS). Does Curiosity get a daily wakeup song? "Yup! She tends to be less cranky with a good wakeup song. Sol 2: 'Good Morning, Good Morning,' Beatles, Sgt. Pepper's Lonely Hearts Club. Sol 3: 'Good Morning, Good Morning,' from 'Singing in the Rain.' Sol 5: 'The Ride of the Valkyries,' Wagner. R10 Victory Song: Theme from 'Mission Impossible.' Sol 6: 'Got the Time' by Anthrax, and 'Echelon' by 30 Seconds to Mars. Sol 7: The Doors - 'Break on Through,' and George Harrison - 'Got My Mind Set on You.' Sol 8: Theme from Star Wars by John Williams. Sol 9: 'Wake Up, Little Susie' by Simon and Garfunkel. Sol 10: Frank Sinatra, 'Come Fly With Me.'" Can Curiosity drive at night? Does it have lights? "There are no lights on the rover. It utilizes the night time to recharge the batteries [from its nuclear-powered generator] to drive and explore during the day to take advantage of the daytime." Keri Bean said that Curiosity will take pictures of the night sky once it's fully into its science mission. The processor you guys used feels ancient to me. How did you program on it? "You are right that the processor does feel ancient," Grinblat wrote. "Our current smartphones are more powerful. The reasoning for this is threefold. First of all, the computer was selected about eight years ago, so we have the latest and greatest space-certified parts that existed then. Second of all, it was the most robust and proven space-grade processor at that time. Thirdly, in order to make a processor radiation-hardened it requires lots of tricks on the silicon that are not conducive to making it fast. Given that, it does not run any GUIs and can just focus on raw programming, and actually gets a lot done. All of the programming is done in C, and our toolchain is very similar to programming on any platform." Has there been any work to increase the bandwidth between Earth and Mars? "NASA's Mars Reconnaissance Orbiter (2006) is capable of returning 6 megabits/second to Earth from Mars. This is comparable to Wi-Fi, but at about 100 million miles away! Just don't count on it for playing games with people on other planets, since the round-trip light time delay can be about 30 minutes. (Depends on distance between Earth to Mars, which varies as the two planets circle the sun). Currently, at best, Curiosity can transmit data to MRO at 2 megabits/second. Back on Earth, we are researching new communications technologies like laser communications which we hope to eventually use on deep space missions for even better performance." Does Curiosity have the capability to leave 96-mile-wide Gale Crater? "There are no plans to leave the crater, but if we wanted to and had all the time in the world, it's possible we'd find a route out. The Spirit rover proved it could climb a 'mountain' within Gusev Crater, and we've done a lot of testing going up inclines with the Curiosity double." Do you play video games? "Yes, a lot of us do. Scott [McCloskey] claims to have played a good amount [of] WoW ['World of Warcraft'] and Diablo. Rob has played a lot of Mass Effect and entirely too much Super Mario Bros."
How many Macs, how many PCs. "In this room: 12 Mac, 3 PCs," Magdy Bareh wrote. A later comment: "But really, we use everything: Macs, PCs, Linux, etc." Which operating system does the rover use? VxWorks, which has been used on Mars surface missions since Pathfinder in 1997. Why doesn't NASA have a rover model available for schools and the public? "Mattel is coming out with a toy in the next month or so, but it will be decidedly low-tech and low-cost," Veronica McGregor wrote. "We figure more companies may jump in to make them now that we've had a successful landing. There's been a plea by several folks for a Lego toy, and people can up-vote that one. ..."
Stephen Pakbaz, an engineer who worked on the real Curiosity rover at NASA's Jet Propulsion Laboratory, created this Lego model of the rover being lowered down by its sky-crane descent stage. What's your favorite beverage? "I think we all pretty much agree it's beer," one team member wrote. For Rob Zimmerman, it's Stone IPA. For Scott McCloskey, it's Saison Dupont. Were there any educational or science-oriented TV shows that influenced you while you were growing up? "Hands-down favorite show as kids for most in the room was 'Bill Nye the Science Guy.' A few watched 'Star Trek TNG.' As for current state of science/education programming, people are looking forward to the reboot of 'Cosmos' with Neil deGrasse Tyson. On the other hand, many documentaries on cable TV channels are filled with hype and factual inaccuracies. Caveat emptor." Favorite sci-fi movies, or movies in general? "Quick poll around the room: Star Wars, Star Trek, Fifth Element, Brazil, Deep Impact, 2001, Love Actually, The Big Lebowski, The Notebook, Tropic Thunder, Holy Grail, Labyrinth, Spaceballs, Office Space, also, Star Wars (eps 4-6 ONLY)." Favorite planet? "I have to say Mars. :) Although I go storm-chasing a lot, so Earth isn't all that bad," Keri Bean wrote. Can you guys please do a "Call Me Maybe" parody? "I just landed / And this is crazy / But here's my comm window / So call me maybe." What's ahead for the entry, descent and landing team? "We're staying together at least part-time for the reconstruction/data analysis effort. After that, it's uncertain right now. The NASA Mars program budget recently took a hit, and the possibility of a 2018 lander looks remote, but those within the Mars community are trying to find a way to keep Mars exploration alive. We also have some technology development efforts going on, such as Low Density Supersonic Decelerator. Let's hope those in charge of the budget realize the importance of space exploration!" Systems engineer Rob Zimmerman is not impressed in this group portrait of Curiosity mission team members. Are you impressed? 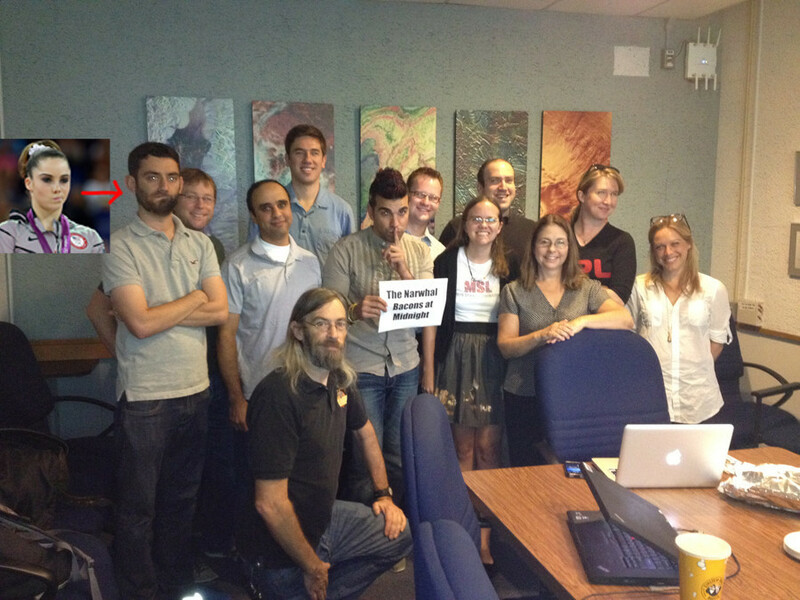 During the session, one Redditor came up with a "McKayla Is Not Impressed" meme for the Mars team's Twitpic portrait. In this picture, Rob Zimmerman is the one who's not impressed. "OK, I just showed this to the room and we laughed for about 5 minutes. AWESOME!" Ferdowsi wrote. Twitter provides the best way to keep tabs on what the Mars team is doing. They're generally a chatty bunch. This Twitter list, compiled by Tara Tiger Brown, focuses on the women of the Curiosity mission. (You'll also want to check out Brown's story for Forbes about the "women in the blue shirts who dare mighty things.") Keri Bean maintains her own Twitter list of Mars tweeps, male and female.